1).Among the following state, which has notified that forests in Aravali range is not forests? 2).The Supreme Court of India has appointed ______ to head the team probing the Indian Premiere League scandal? 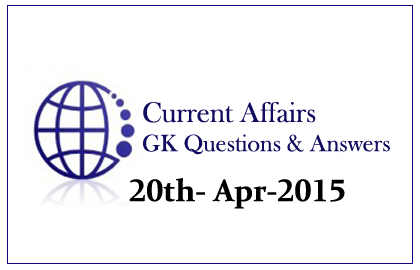 3).Which of the following High Court has completed its 100 years of Celebration in April 2015? 4).Who is the winner of the 2015 Bahrain Grand Prix of Formula One? 5).Among the following, who is the NOT one of the three Indian race walkers that have qualified for 2016 Rio Olympics? 6).Who is the first Indian women to climb the Mount Everest summit twice in a week? 7).Recently, a report on Global E-Waste monitor 2014 was released by which of the following organizations? 8).Ankit Keshri is related to which of the following sports? 9).What is the name of the India’s first of stealth destroyers under the P 15-B project? 10).Which of the following bank has launched Tap-n-Pay payment service recently?